Luis (left) weighs a bag of beans, with Victor and Donna. Early on the last Friday of the CSA season, the sun rose steadily in the sky, and late season tomatoes in vegetable beds overrun with weeds glittered with the last fat drops of morning dew. Inside the big metal barn at Bee Heaven Farm, work had already started on packing the last shares of the season. 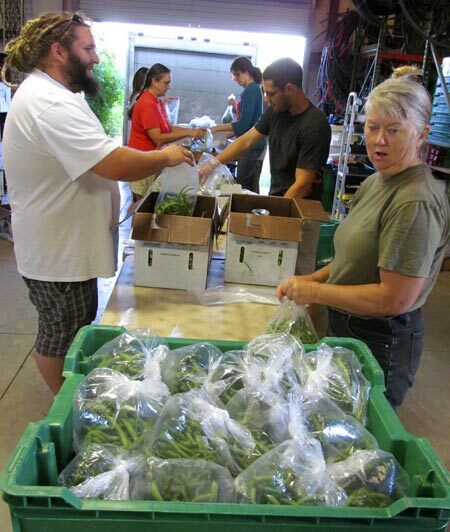 First, green beans had to be weighed and bagged. They had arrived the day before from Witt Road Farms in La Belle. 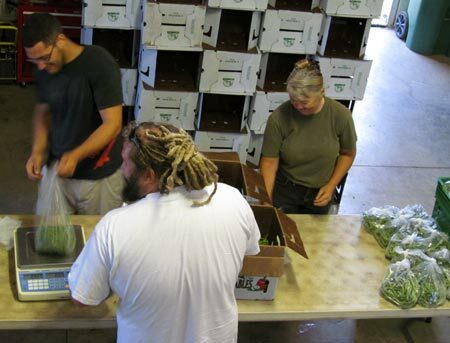 Several full bushel boxes needed to be portioned out equally. Family shares got one pound, and small shares got half a pound. The farm interns got into two teams to divide up the work. In each team, two people bagged and weighed, and two tied and counted the bags. 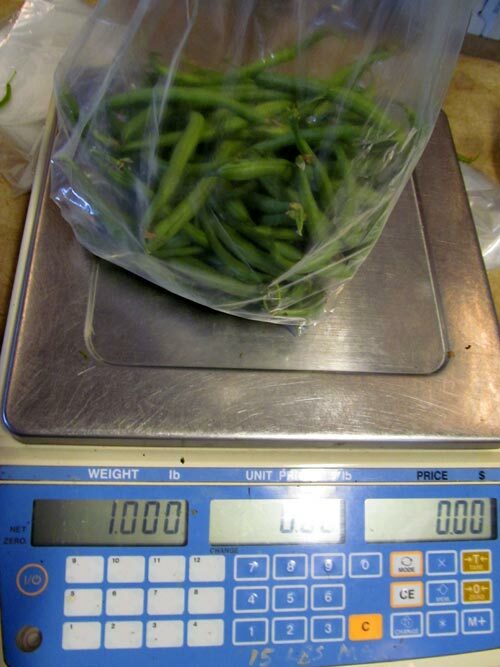 Exactly one pound of green beans. On my team, Victor and Luis bagged and weighed. Donna and I had the job of tying and counting. Donna showed me a cool, quick technique to tie a bag. She explained, “First you smush the air out of it, then fold over the top edge. Hold the two corners, flip the bag around a couple times, then knot the corners together.” The first time I tried flipping the bag, I smacked myself in the chest and Donna and I both laughed. “Better than your face,” she teased. 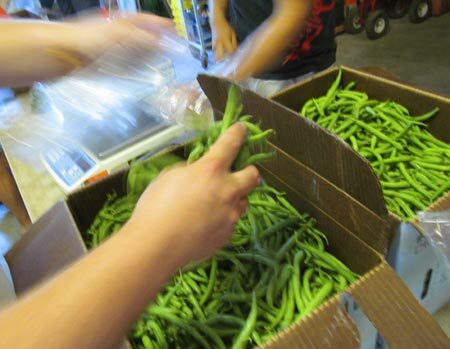 She and I placed bags of beans into rows of five, counted, then loaded them into a green tote. Bag, weigh, tie, count. Bag, weigh, tie, count. The two teams bantered back and forth as they packed with a quick and easy flow that came from weeks of working together. Bag, weigh, tie, count. In 20 minutes it was all over — the crew packed 115 one-pound bags and 242 half-pound bags — and it wasn’t even 7:30 yet!